We knitters find inspiration in all sorts of places. 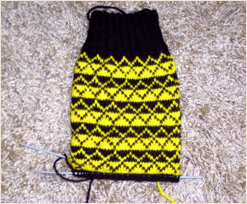 I’ve been working away on fan socks–socks done in colors inspired by the recipient’s favorite football teams, both college and professional. I didn’t work on the socks at all yesterday because I received a very special package containing Apple’s brand new operating system for the Macintosh, OS X version 10.6, a.k.a. Snow Leopard. It was released yesterday and a copy was delivered to my door by the FedEx guy. I purchased the upgrade from the Apple on-line store for $49 for a multiple-use license (a single-use license for the upgrade from 10.5 to 10.6 is only $29) with free overnight shipping. Woo-hoo! So, yesterday I updated the SuperDuper bootable clone of my MacBook, made sure I could boot from the clone, and then took the plunge. 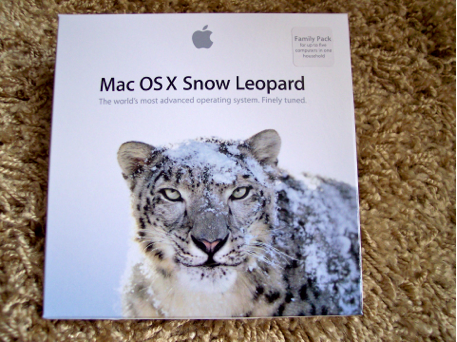 My plan is to use Snow Leopard on my MacBook for a while to see whether there are any conflicts with the applications I use and to see how I like it. If all goes well, I’ll install it on my iMac. Installation couldn’t have been easier. I inserted the upgrade disk into the drive and when the disk window opened, I clicked “Install.” The installation took about an hour and was smooth as silk. I don’t think I lost a single file. So far, all my applications appear to be operating well and my printer works fine. I guess this guy just doesn’t get it. Here’s a clue, Sherlock. It’s inappropriate to joke about killing the president of the United States. Period.